I love reading to my children and have done so even as they were womb sheltered. They love reading now and enjoy it at all times possible and are even top million word readers in their schools! It's so important to spend the time with our children and pass on the love of reading. And when I find a new book, I'm always excited to share with them, you or my little biddies at church. The book "I'm Not A Scaredy-Cat; A Prayer for When You Wish You Were Brave is a perfect story for the little ones. We've all been called over and over to check the closet or leave the lights on or even stay with me until I fall asleep mommy requests. This book helps kids to have power over any fear they might develop. Encouraging them with words and actions will help them realize how to navigate their world with all the unknowns. I love this new book that gives kids the tools to help them when they are feeling nervous, or afraid. 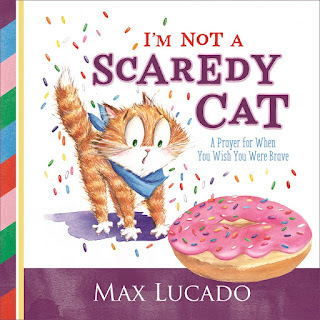 From New York Times bestselling author Max Lucado comes I'm Not a Scaredy-Cat, a hilarious new picture book to help kids manage their fears and worries and learn to trust God. Follow a silly series of misadventures as scaredy-cat faces his worst fears; an appalling abundance of (gulp!) yellow, blue, and pink sprinkles on his donut, an elephant on the verge of a ginormous sneeze, and the terrifyingly loud chime of a clock. For each of the fears, Max provides this reassuring child's version of Philippians 4:6-9. And, God, you love me." A fun read for children and parents, I'm Not a Scaredy-Cat will open doors for important conversations about fear in a non-threatening way and help you instill godly bravery in your kids. This is a fun and easy read for any family. I love that it's not complicated for the little ones to understand. And I am in love with the beautiful illustration in this book. Ms Shirley is quite gifted! I hope you'll grab this book for your bookshelf. With more than 125 million products in print, Max Lucado is America's bestselling inspirational author. He serves the Oak Hills Church in San Antonio, Texas, where he lives with his wife, Denalyn, and their mischievous muff, Andy. An award-winning children's book illustrator, graphic designer, lettering artist, and aspiring author. She creates with watercolor, gouache, pencil, and digital techniques and is living her dream, illustrating and writing picture books in the Bay Area, California. Did your parents read to you when you were a child? Do you remember one of your favorite books? What a great book for kids to understand fear. A lot of children may not understand what they're feeling. My boys still love bedtime stories at 9 and 10 years. This sounds like a book that they would enjoy. I can see this book being good for even my 10 year old. I could have used this when we had to move schools. She was so scared and felt lonely. This was one of the verses that helped her through it. I always seem to have an issue explaining fear to my grand kids. This book would be a great way to help them understand what fear is and how to deal with it. Sounds like a wonderful book for kids! I agree it's os imporatant to encourage a love of reading in kids and adults. This sounds like a cute book. I love to read too! i have always read to my kids and took them to the library weekly. I now get to read to my granddaughter and she enjoys it. This would be a great gift for my friends little one. I like to give books instead of toys. Kids need to read books that give them self-affirmation to be brave and to be good. This look like the right book. My little loves books we read a minimum of 3 a night. its usually the same three. This seems like a book that I need to invest in to give to the little people around me for Christmas. I absolutely love the adult books from Max Lucado I had no idea he wrote a kid's book! Sounds like a great book for the kids to read. Our bedtime is filled with three to four books a night. It always changes. My little sister loves reading books than watching TV, and this book is perfect for her. Saving this for her Xmas gift. This book looks like it is so fun! I would love to pick this up to read to my gbaby! We are always looking for new books to add to our collection. This one looks great!